JOAN MELLEN | Official website of Author and Temple University Professor Joan Mellen. Her twenty-four books, most recently "Blood in the Water", include "A Farewell To Justice," "Our Man In Haiti" and "The Great Game in Cuba," explore the history of the Central Intelligence Agency and its role in the planning and cover-up of the Kennedy assassination. This entry was posted in Uncategorized on February 27, 2019 by John Tripp. 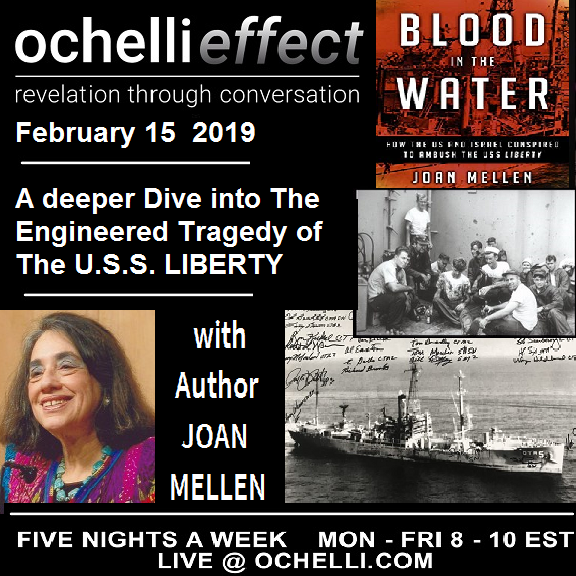 Joan Mellen’s second appearance on the Ochelli Effect discussing the attack on The USS Liberty in 1967. This entry was posted in Uncategorized on February 18, 2019 by John Tripp. 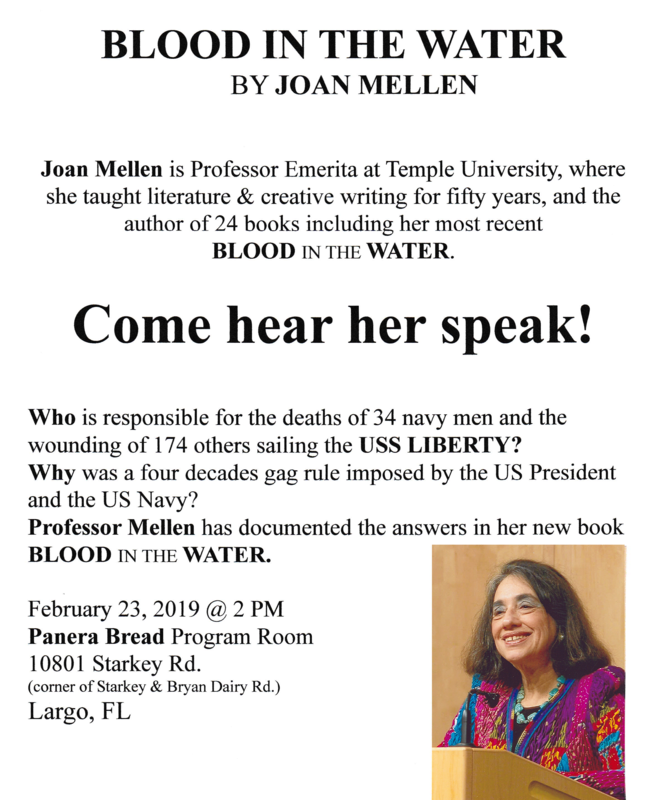 Joan Mellen was interviewed by JFK Conversation’s Alan Dale on her recent book, “Blood in the Water”. This entry was posted in Uncategorized on January 9, 2019 by John Tripp. Despite this American’s eleven years of research regarding the USS Liberty cover-up, I had not been aware of the CIA connection beginning with John Hadden who Mellen ‘discovered’ when she uncovered a memorandum of a meeting between Hadden and Meir Amit, chief of Mossad, the Israeli intelligence services. One of Hadden’s mantras was “never trust anyone” and the chapter introducing the then chief of CIA counterintelligence, James Jesus Angelton titled “Treason At The Top” exemplifies WHY Hadden’s mantra is also a warning for today. 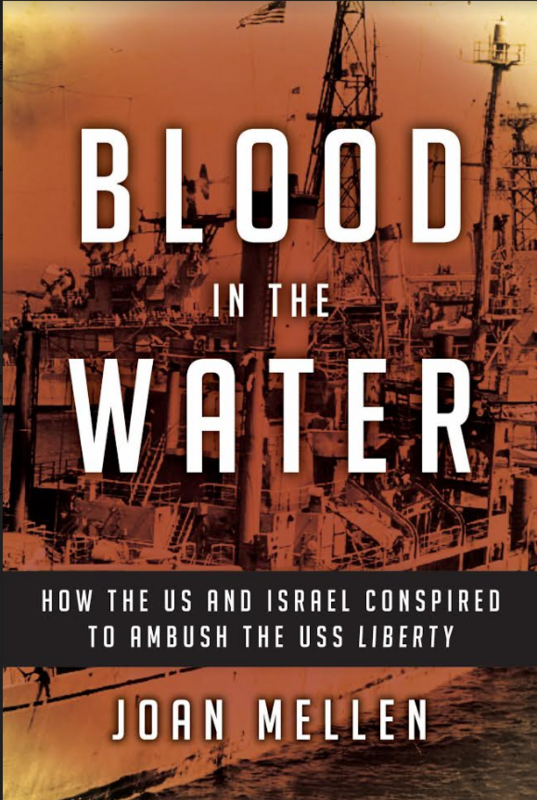 Mellen’s scholarly yet easy to read historical account of the American Governments involvement in the attack on the USS LIBERTY should be a must read for Congress, the White House and CIA; and if it were, it would change the world as we now know it. Mellen uncovered the fact that it was Angelton who “sabotaged John F. Kennedy’s policy to send international inspectors to Dimona, where false walls were erected, elevators hidden, and dummy installations built to conceal evidence of the nuclear weapons program just as nuclear whistle blower Mordechai Vanunu informed this writer a few weeks after his under-reported freedom of speech trial began in 2006. This entry was posted in Uncategorized on December 13, 2018 by John Tripp.